Mexico City (AFP) - An explosion and a fire erupted on an offshore oil platform operated by Mexico's Pemex on Wednesday, killing at least four workers, injuring 16 and forcing 300 to be evacuated. Eight firefighting vessels with water cannons were deployed to battle the blaze as smoke billowed skyward at the Abkatun A-Permanente platform on the Gulf of Mexico's Campeche Sound. The blast took place at 3:40 am in the dehydration and pump area of the platform, located off the coast of eastern Campeche state, the ASEA energy safety agency said in a statement. "The fire is under control but has not been extinguished," a Pemex spokesman told AFP, adding that the explosion had not triggered an oil spill. 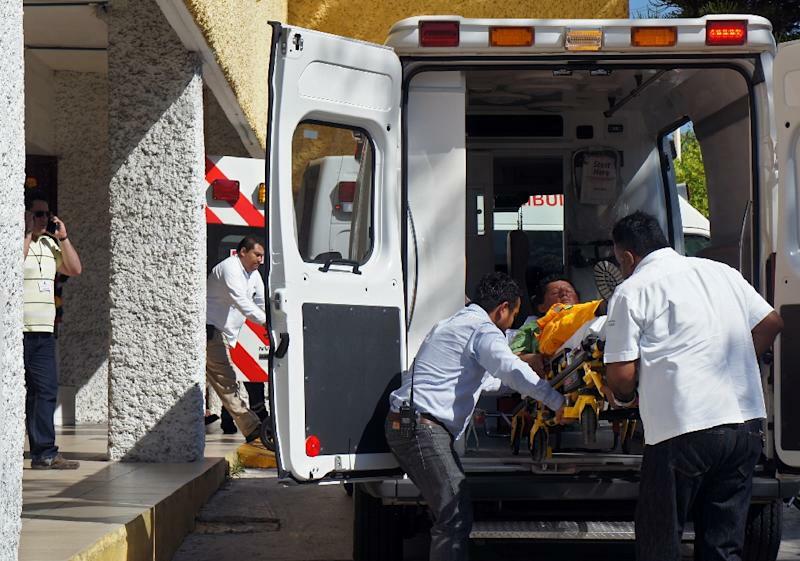 Some 300 workers were taken to other platforms in the area while the injured were transported to Pemex's general hospital in Ciudad de Carmen. Two were in serious condition. AFP obtained a video taken from a boat showing huge flames and smoke engulfing much of the platform in the middle of the night. Pemex said one of the dead was a company employee while another one worked for Cotemar, a contractor. The two others had yet to be identified. "The priority in this emergency is to protect the safety of personnel, contain the fire and care for the injured," the ASEA agency said, adding that all the workers were removed from the rig. President Enrique Pena Nieto expressed condolences to families of the victims and ordered and investigation, which ASEA said it would lead. The Campeche Sound, some 85 kilometers (53 miles) from the coast, contains the two biggest shallow-water oil deposits in Mexico, with 200 platforms extracting 78 percent of the country's crude. Analysts said the accident contributed to a rise in crude prices on Wednesday, with the US benchmark surging $2.49 to close at $50.09 a barrel and London prices rising $1.99 to $57.10. The fire is latest incident to hit the state oil firm in recent years. In 2007, two Pemex platforms collided in the Gulf of Mexico, killing 21 workers and causing a large oil spill. In January 2013, a gas buildup caused an explosion at the company's Mexico City headquarters, killing 37 people. A natural gas plant explosion killed 30 people near the northeastern state of Tamaulipas in September 2012. Pena Nieto pushed through a sweeping energy reform bill last year that opens the sector to foreign investors in a bid to reverse falling production and modernize aging infrastructure. Pemex, which provides a third of Mexico's tax revenue, posted a $17.7 billion loss in 2014, hit by falling global oil prices, fuel thefts by gangs and the peso's drop against the dollar. The government will hold its first auction in July for shallow-water projects on the Gulf of Mexico.